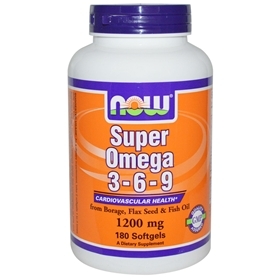 Super Omega 3-6-9 is a blend of Fish, Borage and Organic Flax Seed Oils. This combination of well-known nutritional oils provides a unique balance of Omega-3 and Omega-6 Essential Fatty Acids plus Omega-9, a non-essential, but beneficial fatty acid. The Omega-3's, Alpha Linolenic Acid, EPA and DHA, and the Omega-6, GLA, are necessary for the maintenance of cardiovascular, nervous system and skin health. Oleic Acid, an Omega-9, has also been shown to promote a healthy vascular system. Omega-3 fatty acids protect your cardiovascular system in a number of ways. They help to lower levels of cholesterol that can build up in your arteries and form plaques that increase your risk for a heart attack or stroke. They reduce levels of unhealthy fats called triglycerides in the blood significantly. High levels of triglycerides have been linked to an increased risk for cardiovascular disease. They decrease the risk of abnormal heartbeats, or arrhythmias, which can lead to sudden death. Omega-3's help prevent blood clots from forming. Clots that break off and block a coronary artery to the heart can cause a heart attack. Clots that block the flow of blood to the brain can lead to a stroke, and can lower blood pressure, another risk factor. They reduce inflammation in the body, which helps prevent the blockage arteries from becoming blocked and prevent the re-narrowing of coronary arteries. Borage Oil is a nutritional oil rich in polyunsaturated fats. Linoleic Acid and Gamma Linolenic Acid (GLA) are enhanced essential fatty acids. Although the body can manufacture GLA from dietary linoleic acid, it can be more efficiently utilized for body functions when supplied directly by dietary sources. Suggested Usage: As a dietary supplement, take 2 softgels 1 to 3 times daily with meals. Consider taking this product in combinatioin with NOW® CoQ10 and Tru-E BioComplex™.